The official Orbcomm website will tell you about this 'little LEO' for data messaging that is already operational. Low bandwidth, no phones. See also Korea Orbcomm. Orbcomm filed for US Chapter 11 bankruptcy protection on 15 September 2000. Since then, an auction took place, establishing a new owner: Advanced Communications Technologies. However, they weren't able to reach agreement with Orbital Sciences over FCC licenses. Orbital has since put together its own consortium, and taken control of Orbcomm. If you want to track the satellites using the two-line element set format, here's a recent NORAD two-line element set for Orbcomm. There's a regularly-updated downloadable TLE set from NORAD via NASA's OIG - log into their archive to get historical information. Orbitessera may also be useful. A third set of eight satellites was launched via Pegasus on 23 September 1998. A second set of eight satellites was launched via Pegasus on Sunday 2 August 1998. Two more satellites were launched as secondary payload on a US Navy GEOSAT follow-on launch. Launch coverage is on the Florida Today summary of the week. Since then, two more Pegasus launches were announced and the FCC authorised another twelve satellites. Two satellites were already up for testing when an aircraft-mounted Pegasus rocket put an orbital plane of eight satellites into orbit on 23 December 1997. Images, sounds and movies of that launch are available from the Florida Today summary of the week. 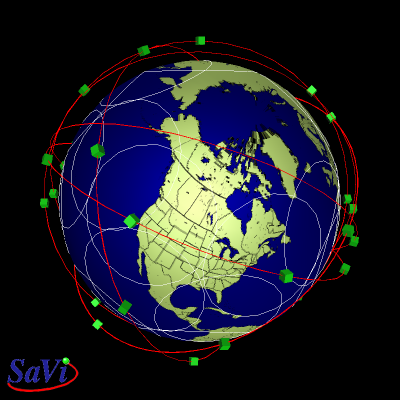 Seven satellites began testing immediately, while the eighth satellite began communication later. A quick summary of the Pegasus launch history is available. NASA summary as described by Mike's Spacecraft Library, with early orbital information on the satellites and orbital planes. Quake Wireless manufactures Orbcomm terminals for various applications. Description of Orbcomm from the Small Satellites Home Page. Remote monitoring terminals from Satellite Smart Solutions in Israel. Quake Global produces modems for use with Orbcomme. Official pictures courtesy of Orbital Sciences. The footprints move over the earth, some at different rates due to different orbital heights.